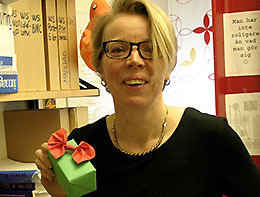 The award for entrepreneurial teacher of the year for 2016 has been awarded to two recipients: Charlotte Norrman and Magnus Klofsten. The jury’s citation recognises the winners as two committed people who for many years have spread a culture of entrepreneurship at LiU. This is the fifth year that the award for entrepreneurial teacher of the year, founded and awarded by LiU Innovation, has been awarded. Its purpose is to encourage actions that enable knowledge and ideas that arise at LiU to benefit the society around the university. This year, Charlotte Norrman and Magnus Klofsten from the Department of Management and Engineering, Division Project, Innovation and Entrepreneurship, share the award and the SEK 20,000 prize money. “And now we have a good reason to buy in some expensive cakes and coffee for a coffee break with our colleagues,” says Magnus Klofsten. Magnus Klofsten, who is professor of innovation and entrepreneurship, and Charlotte Norrman, who is senior lecturer, have worked for several years developing education in entrepreneurship at several levels. Magnus Klofsten describes how entrepreneurship as a research field has developed enormously since he studied it in the 1980s. 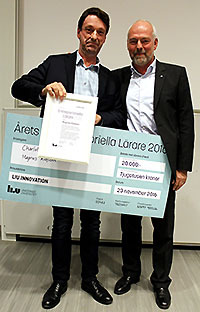 “The award winners for 2016 have in an admirable manner and for many years spread a culture of entrepreneurship at Linköping University – a culture that is important for LiU to be able to live up to increased expectations within innovation and application.